Edit: Thanks for playing! You can find the official answer and explanation here. I had an interesting question come across my desk today which involved a very common area of confusion in OSPF routing logic, and now I'm posing this question to you as a challenge! 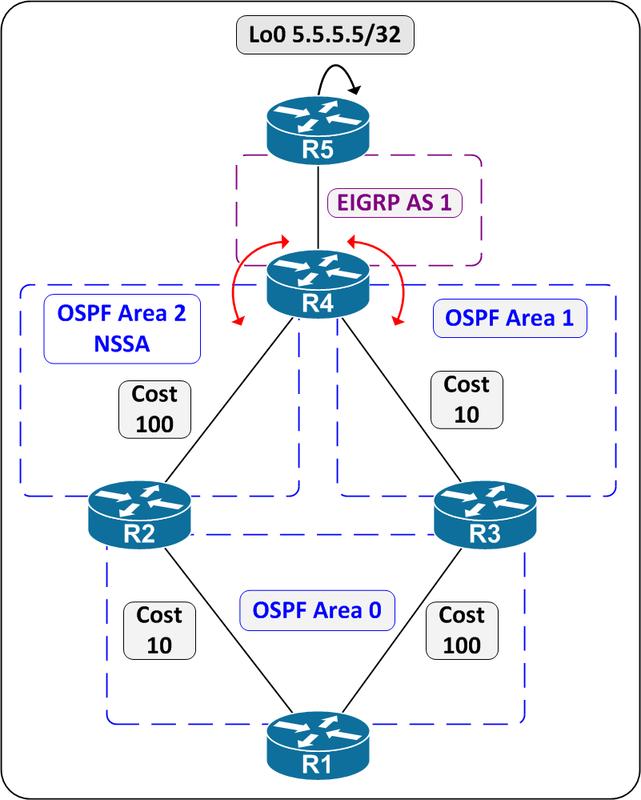 Given the below topology, where R4 mutually redistributes between EIGRP and OSPF, which path(s) will R1 choose to reach the network 5.5.5.5/32, and why? What will R2's path selection to 5.5.5.5/32 be, and why? What will R3's path selection to 5.5.5.5/32 be, and why? Assume R3's link to R1 is lost. Does this affect R1's path selection to 5.5.5.5/32? If so, how? Tomorrow I'll be post topology and config files for CSR1000v, VIRL, GNS3, etc. so you can try this out yourself, but first answer the question without seeing the result and see if your expected result matches the actual result!